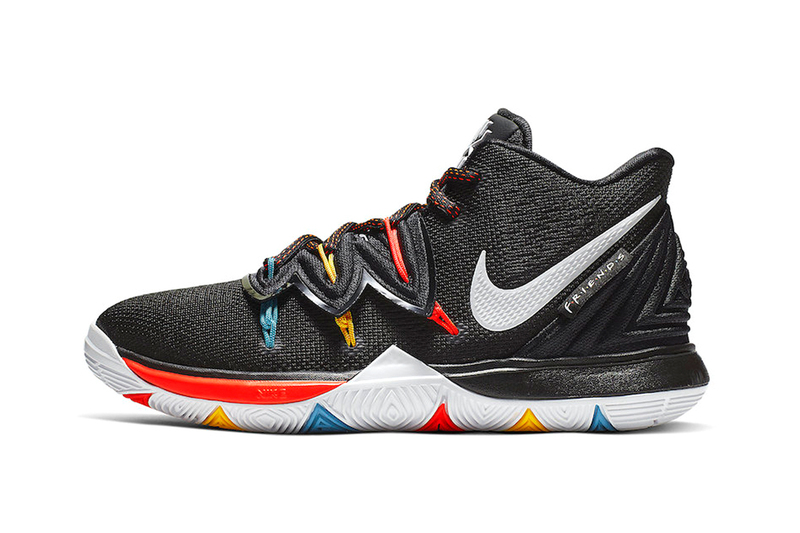 UPDATE: Nike has just released the first official images to the Friends-inspired Nike Kyrie 5 colorway. Check out the full angles of the sneaker in the gallery above. There’s no solid release date yet from Beaverton, but expect Nike to reveal the release date and pricing in the coming months. Original Story Jan 27, 2019): A Friends edition of the Nike Kyrie 5 is set to be released very soon. Die-hard fans of the All-Star NBA player know all too well about his obsession with the sitcom, and that he has its logo tattooed across his arm. As seen from the early images of the new iteration, provided by sneaker_speculation, teal, yellow and orange lace stays secure the red-speckled laces through the venus flytrap-inspired overlay. Contrasting the black and orange midsole is a white outsole that boasts multi-colored accents, while a white Swoosh motif with the official Friends logo solidifies this as an official collab with the TV show. Another Friends logo can also be found on the insole. There isn’t much information about the “Friends” Nike Kyrie 5 but make sure to stay with us for more details on the official drop date. In more sneaker news, Duke’s men’s basketball team gets laced with a special Nike Kyrie 5 PEs. “How many of us have them”?? I mean what can I say lol I’m a fan of the show. Featuring glass slides, sky bridges, gondola pod rides, and more. A black and red spin on the Ewing 33 Hi.